The US Food and Drug Administration has approved a robotic arm, dubbed “Luke” — after Luke Skywalker, the character whose hand is sliced off in a duel and is replaced with a robotic version in the 1980 film “The Empire Strikes Back”. Developed by New Hampshire-based DEKA Research and Development Corp founded by Dean Kamen, the inventor of the Segway and other devices, the bionic arm is capable of performing multiple, simultaneous movements controlled by signals from electromyogram electrodes that detect electrical activity that is caused as a person contracts muscles. “What nature provides us is extraordinary. The opposable thumb, the five finger independently moving, articulating fingers. It’s fantastic what this does,” said Dr Geoffrey Ling, the leader of the project in a “60 Minutes” interview in 2009. The DEKA arm is intended to restore functionality for individuals with upper extremity amputations, namely with limb loss occurring at the shoulder joint, mid-upper arm or mid-lower arm, but not at the elbow or wrist joint. According to the article on CBS News, nearly 90% of the project participants were able to do common household activities — like preparing food and using a zipper — that are simply impossible with other prosthetic aids. This project is still in development and is sponsored by the Defence Advanced Research Projects Agency and the US Army Research Office. 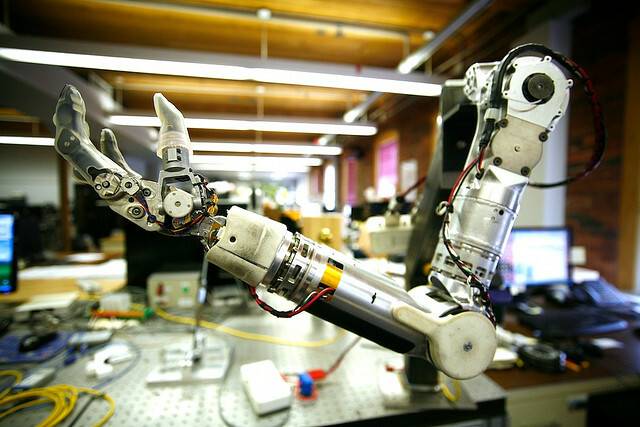 The Pentagon’s Defence Advanced Research Projects Agency (DARPA) reportedly provided over $40 million in funding to DEKA to develop the robotic arm as part of a $100 million project to improve prosthetics. “It was designed to produce near-natural upper extremity control to injured people who have suffered amputations. This arm system has the same size, weight, shape and grip strength as an adult’s arm would be able to produce,” said Justin Sanchez, a Program Manager in DARPA’s biological technologies office. “The DEKA Arm System may allow some people to perform more complex tasks than they can with current prostheses in a way that more closely resembles the natural motion of the arm,” Christy Foreman, Director of the Office of Device Evaluation at the FDA’s Centre for Devices and Radiological Health, said in a statement.